Gingham is the name given to a check or plaid design originally seen in white cotton fabric with the design woven in coloured threads. Because of the way it is made, gingham fabric looks the same on both sides making it economical to use, probably contributing to its worldwide popularity. The design has become a symbol of rustic, country style and is associated with both clothing, and home furnishings. Ever popular as a craft ribbongingham can be used for all occasions and all types of craft projects. 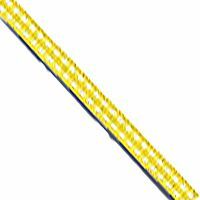 This 7mm wide gingham ribbonworks well on cards, scrapbook layouts or for giftwrapping. Seen here in summery yellow, also available in five other colours.